A concert presentation of a custom-design instrument for Coppice by Andrew Furse (of Tiny Music). The event will also include a performance of Seam as a trio with electro-acoustic cellist Sarah J. Ritch. 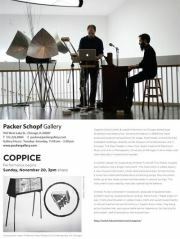 Coppice (Noé Cuéllar & Joseph Kramer) is a Chicago-based duet of bellows and electronics. Since its formation in 2009 they have produced original compositions for stage, fixed media, and performed installation settings, recently presented at the Museum of Contemporary Art, New Music at the Green Mill, New Capital, and ACRE (Chicago); Music with a View (New York); Spark Festival of Electronic Music and Arts (Minneapolis); McNeill Street Pumping Station New Music Festival (Shreveport); as well as internationally in Iceland and Sweden.